A lanyard is a decoration for knife, woven from cord or twine. However, the lanyard has not only a decorative function. For example, it makes more convenient the use of knives with short or narrow grip. Weave the lanyard is quite simple – all you need is the right material and knowing a few techniques of weaving. Select a material. The lanyard is better to weave, synthetic cord, because this material is wear resistant and does not rot from moisture. In addition, the ends of synthetic cord you can zaplavit, and it will be more reliable fastening than a traditional end node. Lace it is desirable to select a round, not flat. The length and thickness of the cord will determine the future size of the product, so, for example, for a voluminous and a short lanyard should be selected coarse and thick cord of length 50 cm Color cord lanyard to be used outdoors, it is better to choose bright, so he was clearly visible in the grass or in the snow. Take the knife to which you want to attach a lanyard. At the end of the handle of the knife should be a hole for fixing a lanyard. Some small knife with a metal handle there is a special loop. If no loops no holes in your knife, you need to carefully drill a hole with a diameter of 5 mm. Take the two cut cord length of about 25 cm They can be the same color, but the knots, woven of multi-colored ropes look much more elegant. Thread one of the cords into the hole on the knife handle and tie a simple knot connecting the center of the second cord. Splitit received four cord into the cage. This requires the ends to overlay each other at right angles, so that every cord is passed under the ahead. Tighten the weave fairly tight, tighter than twisted cords in the product, the neater and more durable it turns out the lanyard. Tie a knot at the end of the lanyard. Stub ends trim or hide inside the product. Can previously melted over a flame to prevent unraveling of the product. However, it should be remembered that armored lanyard it will be impossible to dissolve, if desired, and have just cut away from the arm. 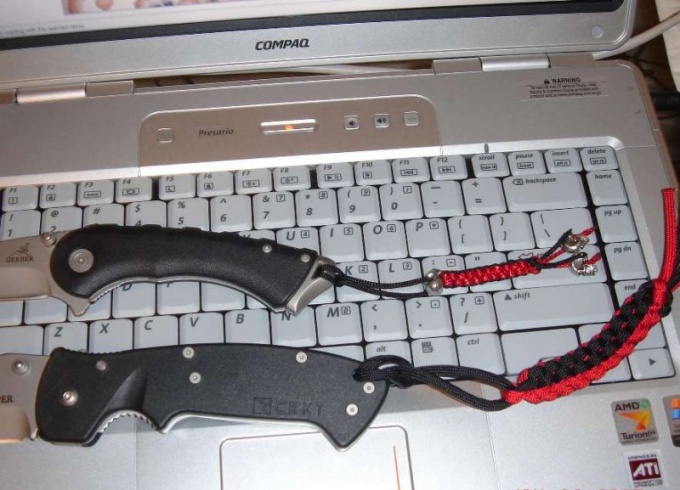 A lanyard can be decorated not only knives, but any appropriate travel gear – such as a flashlight or a box with the compass.